Undemanding and versatile. Luxuriant foliage and unusual flower color blend well with many plants. Can be divided in early spring. 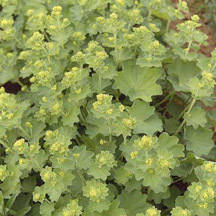 Lady's mantle forms clumps of gray-green foliage that are attractive all season long. They are especially lovely early in the day as the leaves have a knack for holding large, glistening dew drops. Delicate, yellow sprays of flowers appear from June to August. The flowers are useful in bouquets and last for several days. They can also be dried for winter bouquets. Lady's Mantle is a good spreader, making it useful as a ground cover for shadier areas. Removing spent flowers will keep the plant tidier and prolong the bloom period. Division is seldom necessary to maintain vigor but 3 to 4 year old plants can be divided as a means of obtaining new plants. Self sown seedlings can also be lifted for additional plants.